Paper & Digital Pain is the number one need in the Organizing Industry. If you want to help your clients in a powerful way consider getting trained and certified. 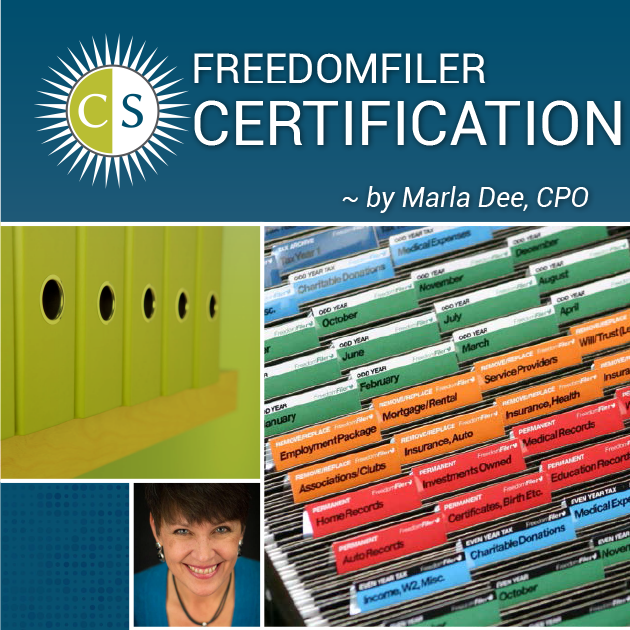 Welcome to an in-depth training of FreedomFiler, the world’s best all encompassing, self purging filing system for home or small business. By choosing Clear & SIMPLE for your training you will also receive a BONUS GIFT of Get Organized, the Clear & SIMPLE Way audiobook, by Marla Dee, along with other gifts. The Virtual Training is given in three modules together with homework. Following your sessions, you will complete a written self exam and verbal exam with Seth Odam. Upon completion of these exercises you will be certified. FreedomFiler offers a tremendous support system for you and your clients. Thank you for allowing me to share this fantastic system with you!